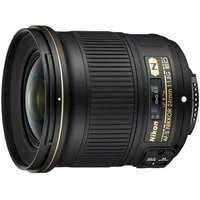 Nikon extends its versatile f/1.8 line-up of prime lenses with the Nikon 24mm f/1.8G ED AF-S lens. Lighter and more compact than its brother, this fast FX-format lens easily captures dynamic, immersive images. The fast f/1.8 aperture delivers shallow depth of field, smooth bokeh and clear low-light images. A close focus distance of just 0.23m offers additional versatility, while the compact and lightweight design makes this lens a great travel companion.